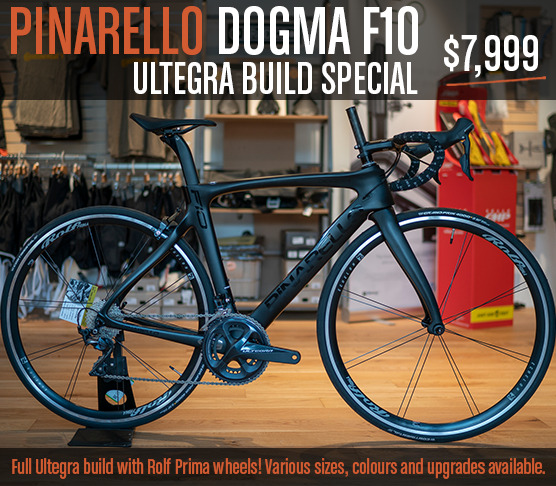 Get a full Ultegra build, with Rolf Prima wheels for only $200 with the purchase of any in-stock Dogma F10 frame! That's a complete bike for only $7,999! All builds done custom for you, with upgrades and component changes available. Come on in and we'll get a package put together for you. Various colours and sizes in stock. The season is just getting underway here at the Flying Monkey. The thick layers of ice that covered our parking lot have finally melted away and you riders are starting to roll in again for that hit of caffeination we're so well known for. As usual, we've got lots happening around the shop; final touches to renovations, new product hitting our showrooms and the performance / fit lab has now taken over the lower level of the shop (we're already getting well booked for fits, so if you're thinking about it don't hesitate). We're also deep into updating the digital side of things as well at the moment, so please excuse any mess on this site and expect to see a ton more content and our online shop breaking cover here soon! We're currently open with our spring hours at the moment, with full summer hours coming soon once we're confident we can pack the snow shovels away until next year. Please find out what others say about our services! Stay up-to-date with what's going on at the shop! Join our mailing list for news on events, products and sales.